We got the first good night of sleep of probably our entire trip in Vegas. The beds were amazing, and it probably helped that we were all worn out anyway. I woke up after a good eight hours of sleep feeling like a new woman. It was a good thing too, because we had two National Parks to hit up before visiting LA and then stopping at Manhattan Beach for the night. We briefly considered cutting out the parks to be able to sleep longer and see more of LA and the beach. But, as much as I want to be able to stay on the beach forever, I don’t want to look back on the trip and regret missing something. I’m already planning a trip for next summer to come back to spend more time in the Southwestern Colorado/Utah area. Death Valley was the first park we saw. We paused only at Zebriskie Point to reenact a scene from the 70’s film of the same name. I sincerely doubt you’ve seen this movie; I’ve never seen this movie, just heard about it. One of Amanda’s jobs with the Cincinnati Art Museum was to show films, and this was one of them. The movie includes, among other things, a guy stealing a plane, meeting a girl in a convertible in Death Valley, leaving her, then crashing his plane. And I believe the movie ends with pretty much everything in the world blowing up. The only thing Amanda wanted to do is reenact the scene where boy in plane and girl in convertible meet in the desert. Originally, we were supposed to buy Barbie and Ken dolls with toy airplanes. 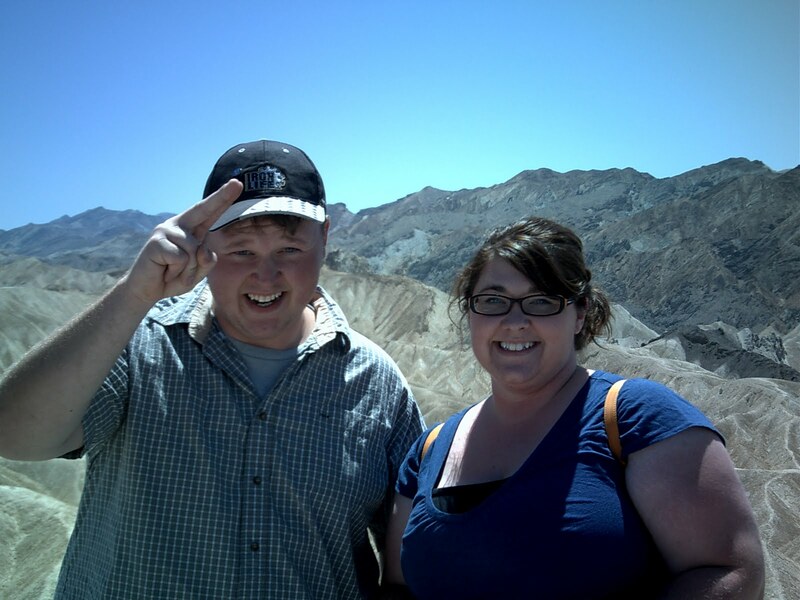 we didn’t realize until we were in Death Valley that we forgot our reenactment supplies. All was not lost! I still had some of the papers from the various KOAs we had stayed in, and was able to fashion a paper airplane, a box-shaped convertible and two stick people drawn on paper. Cory acted the part of the guy, Amanda did the girl and the plane crash was perfect. I’ll have another version posted here once I get back home. (I couldn’t bring myself to stay in the hotel room to upload with the beach just a block away! 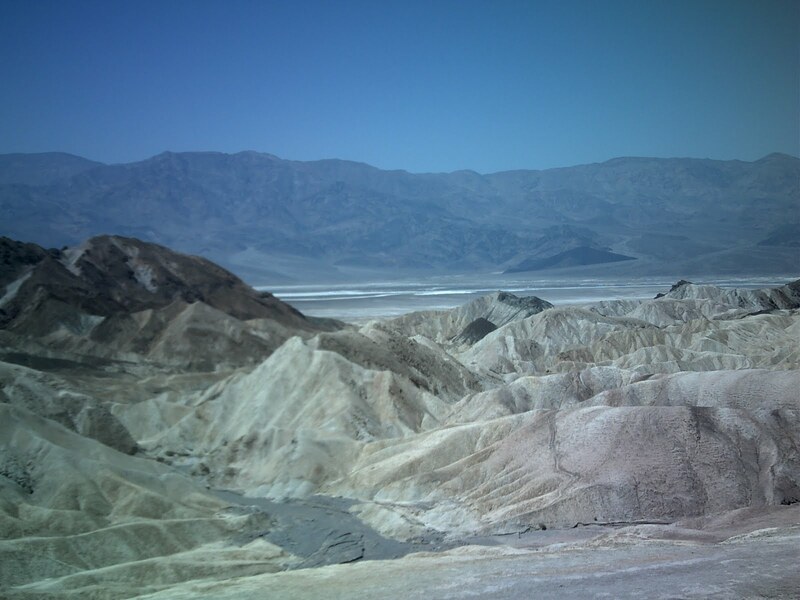 I attached a picture to this post of Death Valley. It was a very beautiful place — that I would not want to be left in for too long. Our next stop was Sequoia National Monument. In an effort to cut down on some time so we could check in at an earlier time, I used the atlas to plot an anternate route. Originally we were going to go up to the National Park and take a short tour. Instead we didn’t go as far north, and we missed a lot. We did get to follow the Trail of 100 Giants, but we missed the best of the sights of the park. The worst part of my alternate route was that this was the one thing Cory specifically asked if we’d see, and we completely missed everything he wanted to see. Once we got out of the park, we were about three hours from LA. We managed to find the walk of fame easily enough, but we missed the Hollywood sign entirely. Can someone tell me why that’s not lit up at night? We searched for some names we knew on the Walk of Fame, but short of some older stars, we were unsuccessful. We searched over three blocks or so, but the best star I could find (to me, anyway) was Gregory Peck, one of my favorite classic film stars. Before we could get back to the car we had a run-in with the paparazzi. I tell you, I can’t go anywhere without those guys following me. Haha. 🙂 Actually, we just missed a celebrity darting from their car door to the door of Katsuya, a restaurant frequented by starlets, according to Amanda. The last of the flash bulbs were popping as we wound our way through some very well-dressed young women waiting to go inside. Our next stop was Manhattan Beach, and our first sighting of the Pacific Ocean. This entry was posted in California, Gypsy Trip, Los Angeles and tagged California, Gypsy Trip, Los Angeles by Cassie. Bookmark the permalink.